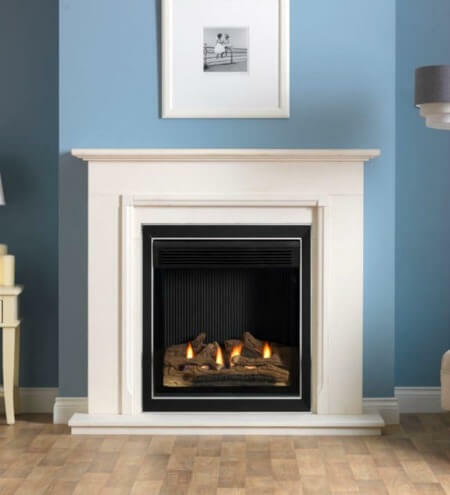 Gas fires without chimneys are probably one of the most commonly asked about fireplaces. If you don’t have an existing chimney, there are still great options available for you to enjoy a fireplace, such as balanced flue gas fires or electric fires. However, each of these have their pros and cons. Balanced flue gas fires have a real flame and low running cost, but involve building work. Electric fires, meanwhile, need minimal building work, but can have a higher running cost and lack a real flame. Related: Do You Need a Chimney to Have a Fireplace? What Are Flueless Gas Fires? Flueless fires are just what their name suggests. They don’t need to be connected to a chimney or flue pipe. Rather, they burn cleanly enough to be able to release their fumes back into the room through a vent at the front or top of the fire. How do Flueless Fires Work? Flueless gas fireplaces work by drawing clean air in from your room through a vent in the front of the fireplace. Some of this air is passed through a heat exchanger to create warm convected air. This warm air is then safely released into your room to provide additional heat to the radiant heat from the fireplace glass. Some of the air taken in from the room is also used to feed the gas flame of your fireplace. After the combustion process, the gases which are produced are then passed through a catalytic converter, before being released back into your room. This filter converts any harmful emissions back into safe gasses which won’t cause you any harm in your home. Find out everything you need to know about gas fires here. A flueless gas fireplace is completely safe to have in your home. However, you must have them fitted strictly to the manufacturer’s instructions and meet all building requirements. It’s also essential that, once fitted, you maintain and operate your flueless fireplace correctly. In addition to these requirements, your flueless gas fire will also have safety measures that will shut the gas supply off if the clean air supply isn’t sufficient. In fact, flueless fires are first tested without their catalytic converter and are found to be just as clean! There are a series of tests all flueless fires must go through before they are allowed to go on sale. Furthermore, their output is usually lower than a gas fire with a flue and is just a fraction of what your gas hob would use. 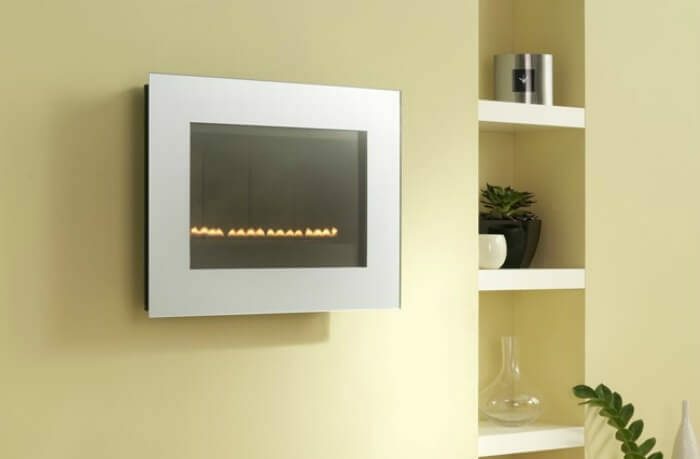 How Are Flueless Gas Fires Fitted? 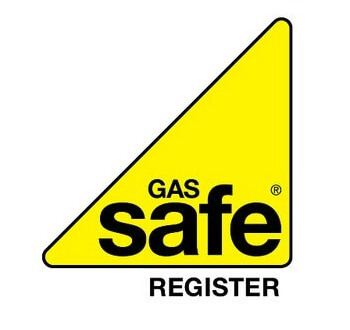 As we said above, it’s most important that you get your flueless gas fire fitted by a Gas Safe Engineer – as with any gas appliance, there are numerous checks that need to be carried out to ensure your fire is running safely. Air Vent. Your gas fire takes oxygen in from your room to burn. To make sure this air supply is replenished, a vent is required, along with a permanent openable window. Usually, your vent should be at least 100cm2 for a room up to 40 cubic metres. However, always check your particular fireplace requirements first. Lack of ventilation can also cause condensation in your room. Minimum room size. Your room should be at least 30 cubic metres to be able to install a flueless gas fire. For a room this size, an output of 2.5kW should be sufficient. There is a good selection of flueless fireplace styles available for you to choose from. A flueless inset gas fire can be fitted in an existing chimney cavity, or built into your wall. Alternatively, our contemporary range of wall mounted and hole in the wall flueless gas fires look great hung up in more modern rooms. To fit them, some drilling work may be required to fit the gas pipe and secure the fixtures. Efficiency. 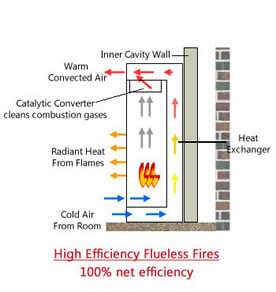 Flueless fires are 100% efficient as no heat is lost up the chimney. Low running cost. Gas is cheaper to use for heating than electric and has a constant easy-to-access supply, unlike wood or coal. Low installation cost. Since you don’t need to install a flue or carry out chimney work, the upfront cost is less than installing a balanced flue. Room requirements. You won’t be able to install a flueless fire if your room is less than 30 cubic metres. Lower heat output. Flueless fires give out less heat, though as none of this is lost through a chimney, they can be just as warm. Must be used alongside central heating. Flueless gas fires aren’t designed to be used as your primary heating method and should be placed in a room with a radiator to minimise condensation. Find out more pros and cons about gas, wood and electric fireplaces in our blog post – Which Type of Fireplace Should You Buy? 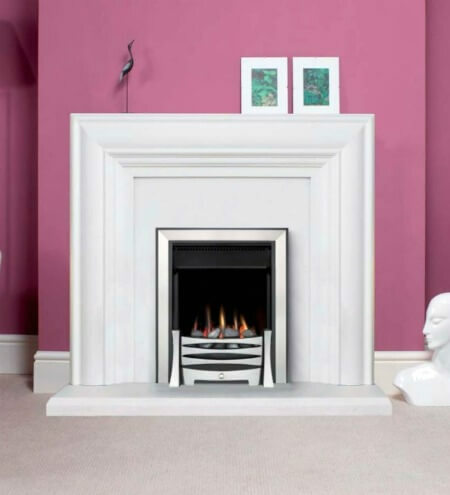 Take a look at all of our flueless inset gas fires and wall mounted flueless gas fires today! If you need any help, contact us to speak to our helpful sales team. Which Gas Fires Are The Most Efficient? | How to Have a Gas Fire Without a Chimney or Flue | Should You Convert Your Open Fire Into a Gas Fire?